When exiled Catalan minister Clara Ponsati spoke recently in Edinburgh she had to explain why the Spanish Constitution was not a mechanism of popular protection, but a way of ordering the transition from the Franco dictatorship to a world acceptable to the Spanish elite and international imperialism. The Spanish state promoted the illusion that the referendum and the declaration of independence were against the law and a popularly agreed constitution. Regrettably, the way the so-called democratic transition was manipulated into existence is badly understood outside of Spain. 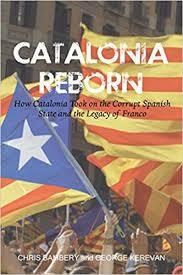 Catalonia Reborn cannot explain this in the detail required, but alerts the reader about some of the main features involved. This, of course, is not the purpose of the book but the reader is warned enough so as not to take the Spanish government’s claims as good coin. Nevertheless, it is essential to outline the history of Catalonia and Spain to explain the resentments. The authors cite the intentions of Manuel Fraga, the main figure early in the change, “The transition is, basically, a process of historical and social amnesia … achieving the unheard of situation in which the dictatorship’s juridico-political framework became the source of legitimacy for the new democratic model.” (p105) This was known in Spanish as the Pacto de Olvida, the pact of forgetting. Acquiescence was achieved by a mixture of bribery to each region creating different rights so that they would be at each other’s throats as well as constant threats of military coups including the attempted one in 1982. The constitution was endorsed 1n 1978 in a referendum with only some Basques (Partido Nacionalista Vasco) voting against it. Spain’s unusual history left Catalonia and the Basque country industrialised anomalies in the backward Spanish kingdom. The discovery of the American continent initially enriched Spain but it kept losing its advantages to better industrialised rivals mainly Holland, France and the United Kingdom. The centralising tendencies in capitalism failed and cities did not grow, industry was ignored to maintain large-scale agriculture. Catalans speak a language that has a long history though to outsiders it may appear as a hybrid of French and Spanish. Spanish repression of the Catalan language began in 1715 when the Bishop of Segorbe demanded there be “one king, one law, one currency […] one language, by which the use of Castilian could be prohibited.”2 This remained a policy until Franco died enforced with sackings, beatings and fines. Now 73.2% of the population speak Catalan and around eight television channels and a hundred radio stations broadcast in the language. Uprisings occurred across Spain from the early years of the twentieth century, especially in the years between 1917 and 1923 when the dictatorship of general Miguel Primo de Rivera imposed itself. The anarcho-syndicalist trade union the CNT was formed quickly building a mass membership in Barcelona and Catalonia. The fall of his successor General Berenguer in 1931 sees the republicans win elections in all major towns and the Borbon king abdicates. The Second Republic is declared. The transformation of Spain begins. Apart from a brief period when Catholic royalists hold power the republic holds together until a military coup occurs led by General Francisco Franco in April 1936. In 1931 the Generalitat, the autonomous Catalan government is established; in 1934 the President Luis Companys declares independence. It is at this time that various observers describe Barcelona and much of Catalonia as being in the hands of the working class, the bourgeoisie having fled or deserted over to the fascists or Franco. “Without exaggeration, it is possible to describe Catalonia between mid-1936 and the start of 1939 as the first and (to date) only fully socialist state ever to emerge in Western Europe.” (p76) This probably is an exaggeration but as the authors point out all companies over a hundred employees were collectivised and placed under workers’ control, all being placed under the central co-ordination of the Catalan Economic Advisory Council, banks were placed under the direct control of the Generalitat, though not nationalised. Peasants were given their land and some lands liberated by military force collectivised. Many other important economic and social were put in place. The book’s strength is that is follows the politics of Catalonia from Franco’s death up to the present day (December 2017). It outlines the way corruption is integral to the Spanish state, arising from the Franco’s time. The way the Spanish state is concentrated around certain financial and industrial concerns and politically expressed firstly through the Partido Popular as well as the other main parties. “[F]ar from being an aberration, corruption is an integral part of the 1978 regime. Post-Franco Spain is akin to post-Communist Russia and China, where the privatisation of state assets led to the creation of a corrupt oligarchy with close relations to the ruling party. Second as an integral part of the 1978 regime’s bureaucratic architecture, the judiciary is heavily politicised. As a result, this judiciary acts as a bulwark against the effective prosecution of corrupt cases.” (p137) The recent fall of Spanish President Mario Rajoy -too late for the book- was a consequence of his involvement in the Gurtel corruption case that is touched upon in the text. A necessary detour to highlights how police-army-mafia type death squads were used to kill off prominent Basques shows how the state has not left its fascistic past behind. The so-called Catalan nationalist parties did vigorously pursue policies of national independence. Covergència i Unió led by Jordi Pujol ran the Generalitat for twenty three years making deals with Spanish parties to obtain devolution settlements. “When Pujol quit the CiU [Artur] Mas was able to see off the old man’s sons and hangers-on and grab the reins of power … a brilliant political operator … he is also the embodiment of that wing of Catalan capital which relies on the art of the manoeuvre to defend its material interests.” (p186) This stratagem of playing Barcelona against Madrid and other political parties against each other came to an end when on Catalonia’s national day (September 11th) 2012 one-and-a-half million protested although the streets of Barcelona against the Spanish Constitutional Court striking down the new Statute of Autonomy. The protests were organised by a new “cultural” civic formation the Assemblea Nacional Catalana. A snap election was called but the CiU lost twelve seats while the outright secessionist Esquerra Republicana de Catalunya (ERC) and the Candidatura d’Unitat Popular (CUP) gained. Mas stayed on a Prime Minister only by obtaining ERC support. Despite Madrid’s opposition, a non-binding popular referendum took place on Sunday, November 9th, 2014. Madrid simply ignored the result. After fresh elections took place almost a year later under the banner Together for Yes (Junts pel Sí) a coalition of independence parties won. As a condition Mas was dropped and Carles Puigdemont became President. And that was before polling began. The writers go through the many manoeuvres that occurred by the many volunteers to outwit the police and authorities as well as how the level of violence that was used. Despite these obstructions, the polling day was a national carnival of joy and anticipation. International observers were clear that all the impediments did not really stop a free and fair election, even if those who were opposed to the referendum did not vote. After a few days Spain’s chief prosecutor had charged Puigdemont and every minister with rebellion, sedition, and misuse of public funds for organising the rebellion. Some were arrested while others fled. Mass protests have become a constant feature of Catalonian life. The spontaneously organised Committees for the Defence of the Republic have started to develop ways of carrying out popular defence from attacks. One major criticism of the Catalan leadership is that they do not place “themselves directly into the Spanish national debate, other than by calling for a new Statute of Autonomy, or latterly to declare UDI.” Another is that they have failed to reassure Spaniards and other foreign nationals currently living Catalonia. Catalonia has ceased to be a non-historic nation and has become central not only to Catalans but Spain and Western Europe. It shows the self-serving interest s of the Eurocrats who want to keep the EU as an elite club for the rich and powerful. It also shows up the pretensions of the many nationalists who want to keep Spain and the so-called international community on side by refusing to stridently give support to their unilateral declaration of independence. 2. p76, Jaume Sobrequés i Callicó, The History of Catalonia, Base Historica, 2007. 3. p467, Paul Preston, The Spanish Holocaust. Inquisition and Extermination in Twentieth Century Spain, Harper Press, 2012.